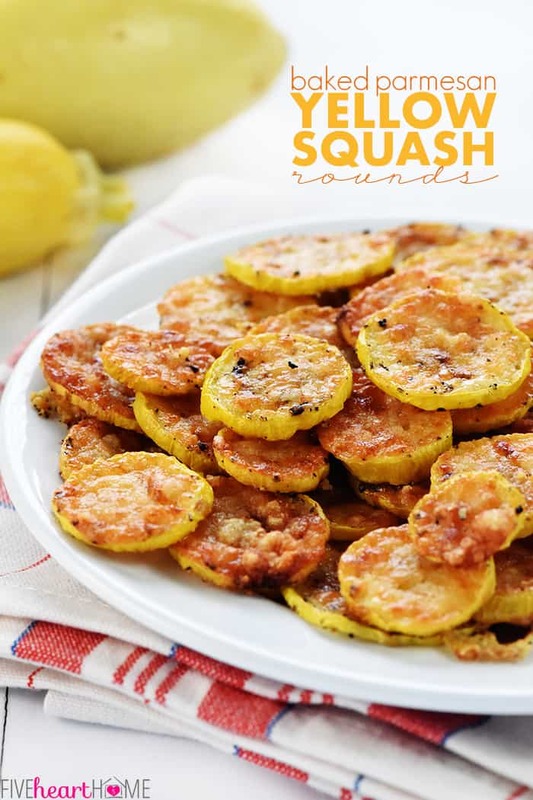 Baked Parmesan Yellow Squash Rounds…an easy and delicious squash recipe requiring just two ingredients: yellow squash and grated Parmesan! 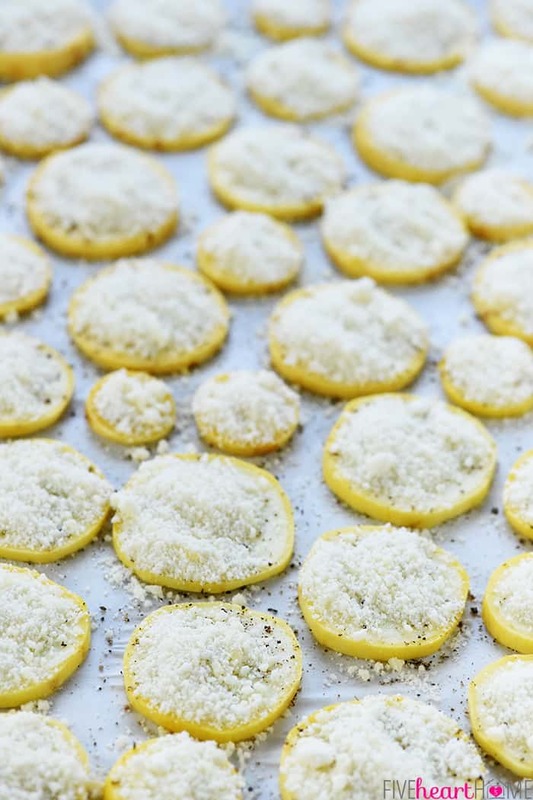 One of my most popular recipes every summer is my Baked Parmesan Zucchini Rounds and this summer has been no exception, as that recipe had enjoyed some viral traffic in recent weeks. 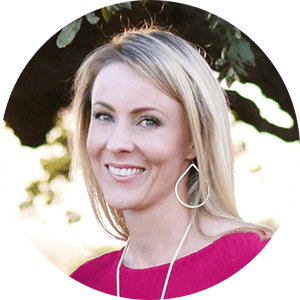 With its most recent surge in popularity, I received a few comments asking if that zucchini squash recipe could be converted into a yellow squash recipe — AKA, summer squash. 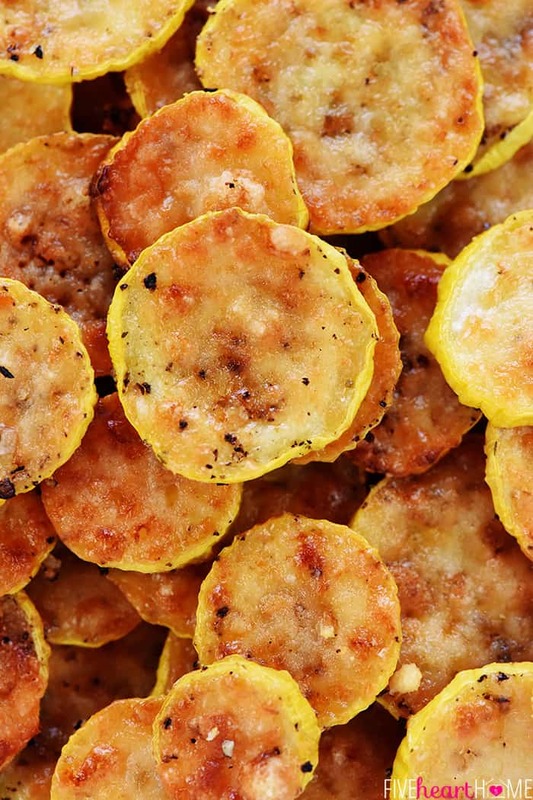 And the truth is, I’d never tried Baked Parmesan Yellow Squash Rounds before, because (1.) it’s hard for me to believe that the zucchini version of this recipe could be improved upon, and (2.) I typically only care for yellow squash when it’s cooked in very specific ways (think cheesy, cracker-topped, baked Southern Squash Casserole). But the question intrigued me, and so I decided to give Baked Parmesan Yellow Squash Rounds a go. And Y’ALL…why did I never try them before??? Not only was this squash recipe every bit as tasty as its zucchini cousins, but it was equally addictive, too! As soon as I finished taking these photos, my 7-year-old, my husband, and I stood around the plate and polished off every last one of these suckers (we grabbed them with our fingers and I’m not even sorry). It was like the best kind of appetizer, and I admit to feeling just a tad smug that the three of us downed two whole, nutritious yellow squashes in a matter of minutes. 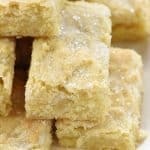 It’s hard to believe that a recipe requiring just two simple ingredients could be so yummy. 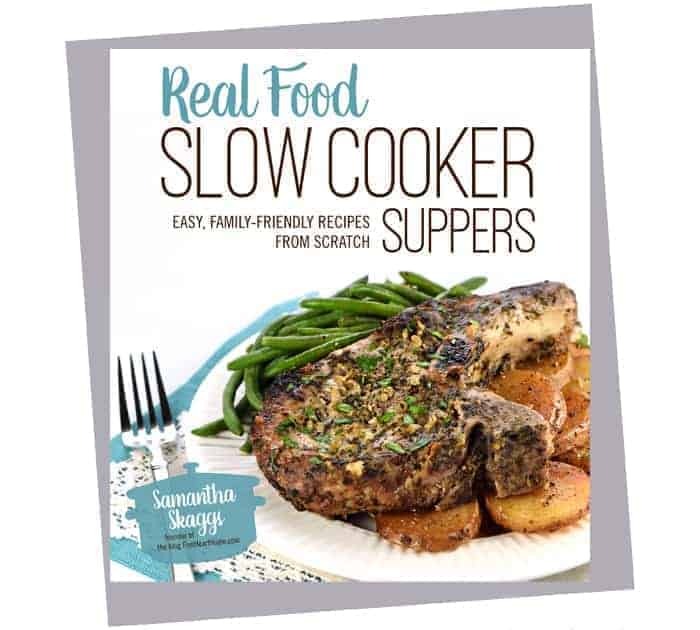 But it is…and it’s super easy to make, too! 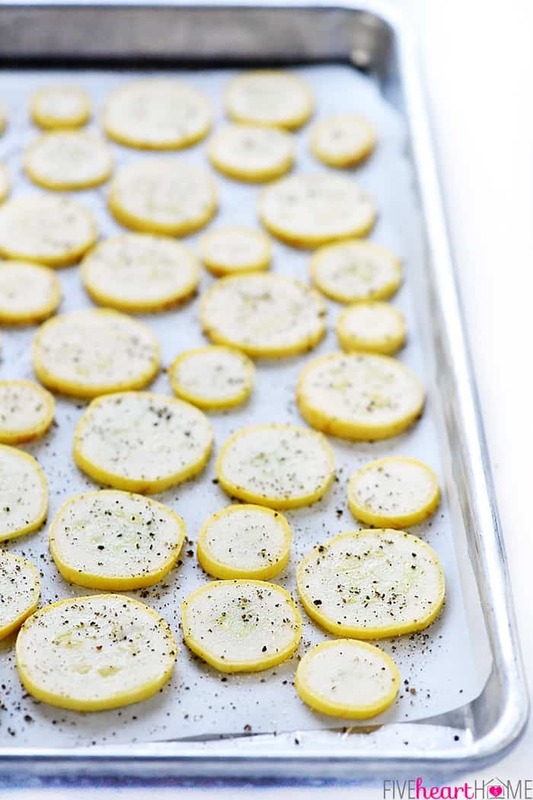 Just cut your yellow squash into slices that are no more than 1/4-inch thick (remembering that they’ll shrink in diameter and thickness as they bake), arrange them on a baking sheet, and sprinkle them with salt and pepper (I actually like to use garlic salt for extra flavor). Then use a small spoon to top each piece of squash with a mound of freshly-grated Parmesan cheese. Bake until the squash is soft and the cheese is melted and bubbly. You can even broil them for a minute or two at the end to get that cheese nice and golden brown, which is what I like to do (just watch them carefully so they don’t burn!). Now, I’m going to inevitably get questions about the Parmesan cheese that can be used for this recipe. My recommendation is to use freshly-grated Parmesan. You can either grate it yourself or buy it already-grated from the cheese counter area of your grocery store. I feel like real grated Parm is going to melt more smoothly and result in the best flavor and texture. That being said, if you want to try using real shredded Parmesan — or heck, even the contents of that ubiquitous green shaker can 😉 — just be prepared for melting and browning that may look different than what you see in these pics. And don’t miss the video — showing just how EASY these are to make — below! 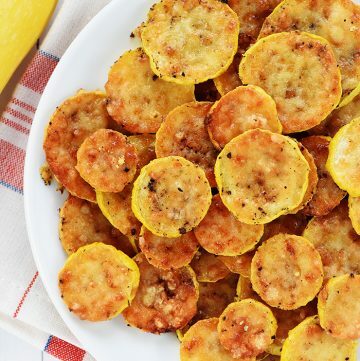 Baked Parmesan Yellow Squash Rounds...an easy and delicious squash recipe requiring just two ingredients: yellow squash and grated Parmesan! Place an oven rack in the center position of the oven. Preheat the oven to 425°F. 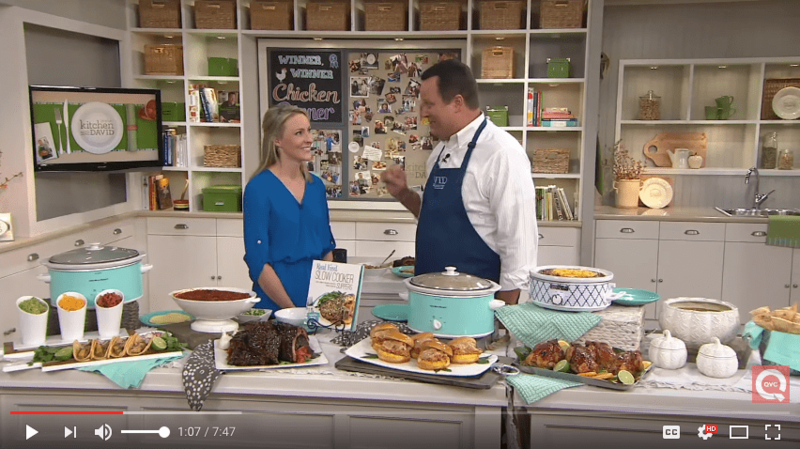 Line a baking sheet with foil (lightly misted with nonstick cooking spray) OR parchment paper. Wash and dry the squash, and then cut each one into 1/4-inch thick slices. Arrange the squash rounds on the prepared pan, with little to no space between them. Lightly sprinkle the squash with garlic salt and freshly ground black pepper. Use a small spoon to spread a thin layer of Parmesan cheese on each slice of squash. Bake for 15 to 20 minutes, or until the Parmesan melts and turns a light golden brown. (Watch these closely the first time you make them and pull them out of the oven early if the Parmesan is golden before 15 minutes. Alternatively, you may broil them for a minute or two at the end of the cooking time to speed up the browning.) Serve immediately. My mom wanted squash casserole and I’m allergic to wheat. 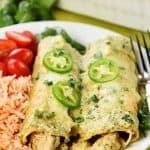 This was such a yummy, healthy compromise! I ate half the pan and everyone loved it. Thank you! These were so yummy and awesome! Thanks for sharing. I will definitely be making this again very soon! Quick and easy!! Added a spritz of spray margarine to brown it up… Delicious!!! My man friend and my son both loved these, as did I. Will definitely be making them several more times this squash season as it looks like we are getting a good crop! Thanks so much for sharing. We had these with dinner tonight. 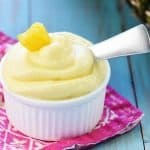 Great, easy recipe; thanks! Delicious side dish; we were lucky enough to have squash from a friends’s garden. Have you made this recipe with zucchini? If so, did this work out also? 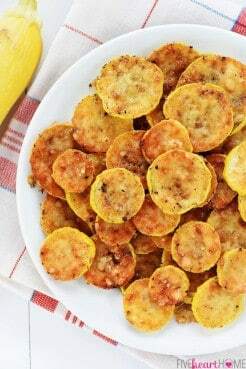 Thank you for this great idea, using yellow squash. A woodchuck had pulled up our zucchini plant which is the squash I always used for this recipe, and I never thought to use yellow squash instead for some reason. I am now hooked on using the yellow squash instead and today did some with shredded cheddar in place of parmesan and it was also terrific. That big fat old woodchuck might just have done me a favor!!! 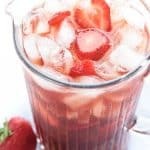 I made this recipe, and this truly tasted Fantastic! I added a few other spices, and julienne carrots, and was impressed with the outcome. Thanks for sharing. The squash was delicious!! Had with steak!!! Quick and easy ? These were so good! So quick and easy! I will try to stop myself from making them nightly! Lol! I make squash rounds all the time, I can’t believe I never thought of putting some cheese on the top! Can’t wait to try it that was, I am picturing it now and it is amazing!